LMS Chairman: Chartres overview: what is it like? Chartres overview: what is it like? Following my post about how the Chartres Pilgrimage 'works', and the series of posts I did as it actually progressed, I am going to say something about what it actually felt like. 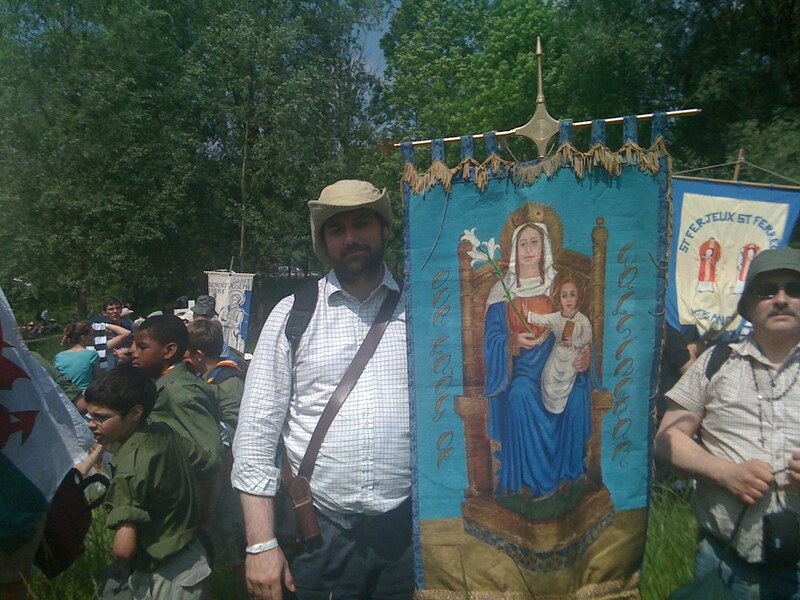 This was my first year on the Chartres pilgrimage. It was a wonderful experience, and I recommend it, not because it is not difficult - it certainly is - but because of the spirit of the pilgrimage, which makes the difficulties possible to bear, and makes the whole thing an overwhelming spiritual experience. First, I should give credit to the French organisers and volunteer helpers. Anyone who has had run-ins with French officialdom will know what I mean by a certain energetic efficiency, but while the thing needs to be brisk and orderly to work at all, they are motivated by a truly Catholic spirit. Charity and common sense are both evident in the vast medical operation run by the Order of Malta, the gigantic quantities of bottled water handed out at regular intervals, and the systematic provision for those unable to walk further. While in that last category myself waiting for transport, I met Fr Nicholas du Chaxel FSSP, who many readers may remember from his years working in England. He explained that he, another priest and a seminarian were looking after the spiritual needs of the volunteer helpers, of whom there were 900. 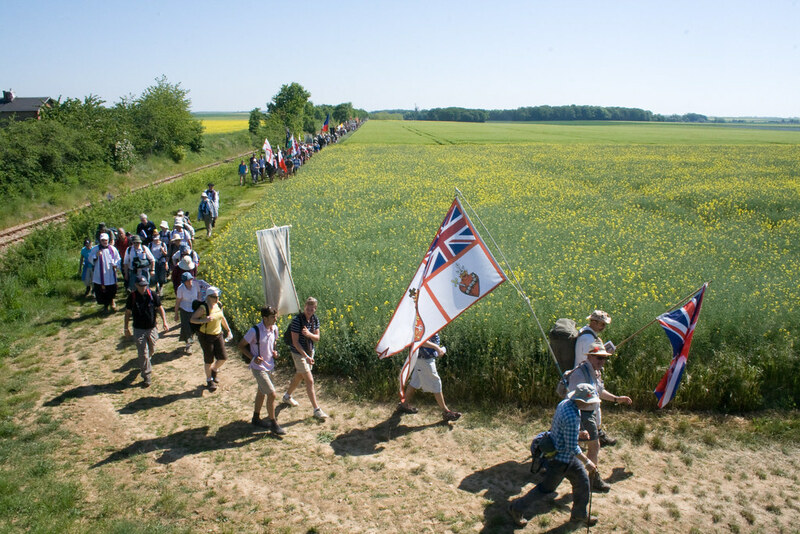 The devotion of the other pilgrims is a real joy to see. First, the vast numbers of chapters, each with its patron saint, ranging from the martyrs who first evangelised the Gauls and then the Franks, to Maxilimial Kolb and Marcel Callo, both victims of the Nazis, Sister Faustina and Mother Theresa. Every part of France is represented, plus (that I saw myself) Germany, Poland, Switzerland, the USA and Ireland, as well as Britain. There are lots of chapters made up of Boy Scouts and Girl Guides. Each has at least one priest, and there were also lots of nuns, making the pilgrimage alongside the laity. And as they go they sing; after a while you tune into to the most common French songs, which in fact we sang ourselves too - the Hail Mary, sung over and over in the Rosary, and the 'theme tune' of the pilgrimage, the hymn 'Chez Nous', which is sung at the end of Mass in Chartres Cathedral, as shown in this YouTube video. 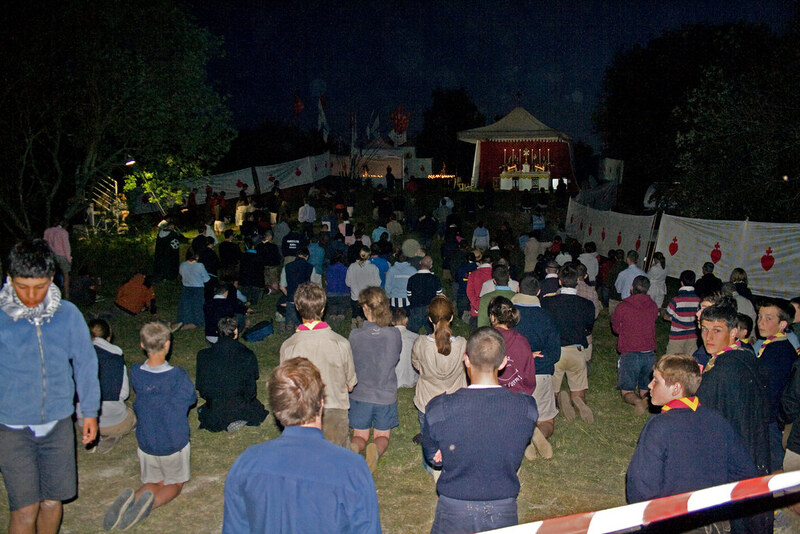 One of the most moving things on the pilgrimage is the Exposition of the Blessed Sacrament at the Gas campsite (on the second night), which carries on all night. The prayers of the pilgrims before the Blessed Sacrament are palpable. Being part of something so enormous is itself a thrilling experience. The column takes an hour and a half to pass a given spot: it is a powerful witness to the faith, and demonstrates that it is far from dead in France. The liturgy is also very moving. To get everyone to Mass it is obviously necessary to make time for everyone to arrive and then after Mass for everyone to leave, which means the lunch stops on the Saturday and Sunday are quite long. 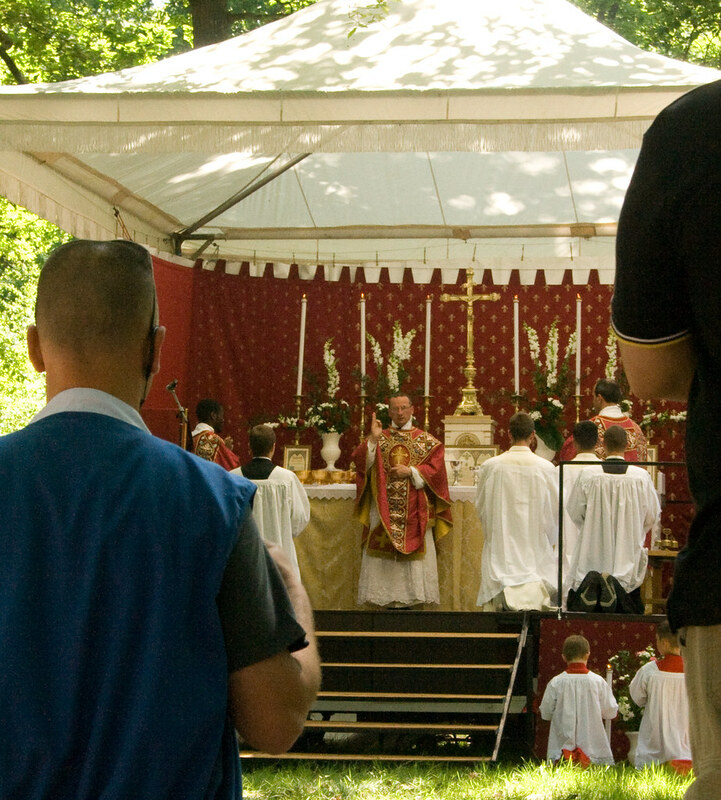 But the Missa Cantata on Saturday and particularly the Solemn Mass on Sunday in the woods (celebrated this year by the Abbot of La Grasse, the Norbertine community), are wonderful. The choirs and scholas are amplified, as well as the sacred ministers, to reach the enormous area occupied by the pilgrims, and the vast numbers of priests (200?) 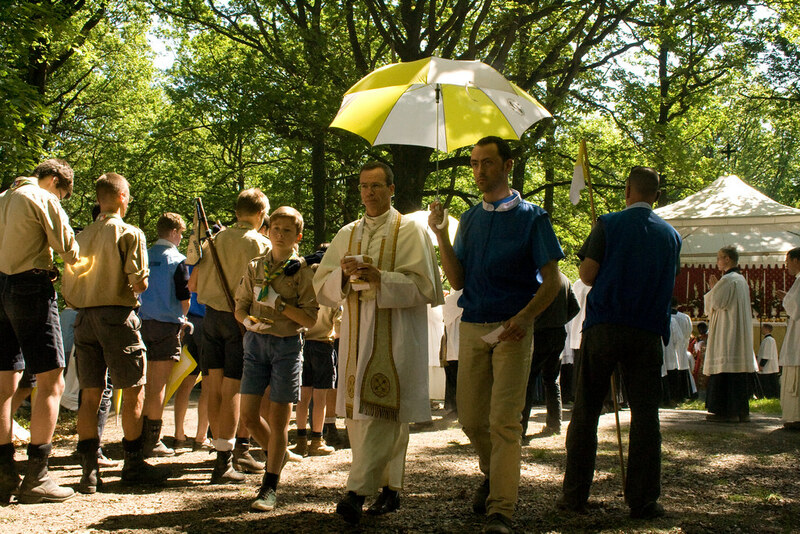 take communion to the faithful, each one accompanied by a boy scout with a communion plate in his white-gloved hands, plus a blue-jacketed volunteer with a yellow and white umbrella (ie an ombrellino, which is folded if the hosts are finished, but otherwise carried over the priest). Finally, the walking. Who would have the nerve to suggest a walking pilgrime involving two successive days covering 28 miles each? On the first day, because of the marshelling in front of Notre Dame and the blessing in the Cathedral, we got up at 4.30am and didn't get into the camp until 8.30 in the evening. Yes, it was killing. I had been training and was quite prepared for a very long walk indeed, but towards the end of that day I developed enormous blisters; coupled with these it was extremely hot, especially in the afternoon, and despite my precautions I got a touch of heat stroke. The last day was the hottest of all, clocking in at 35% C.
Was it worth it? Well, it was penitential, and that was fine. It was a bit mad, and that was fine too. 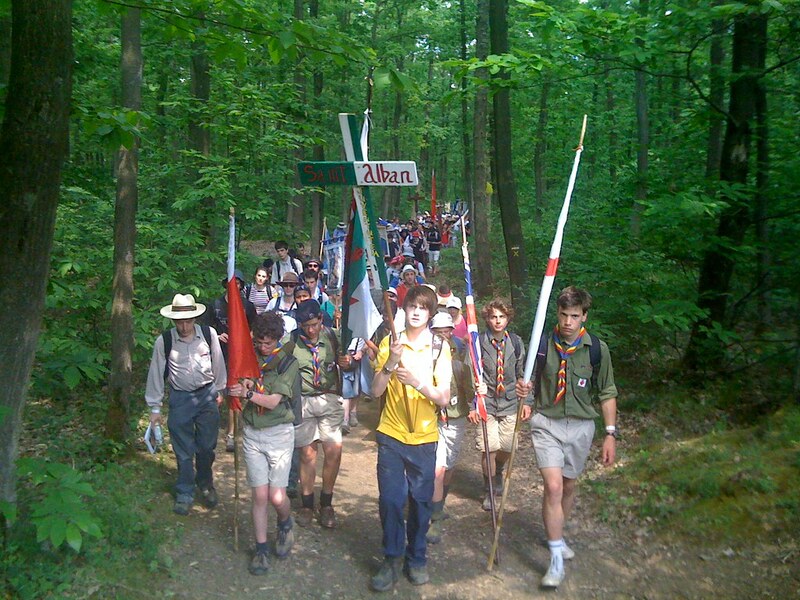 It creates a great bond with one's fellow pilgrims - even the ones you don't meet. The fact is that it is an opportunity to do something genuinly difficult for God. Even the super-fit French boy scouts must be able to go home with a sense of acheivment, especially the ones I saw going for a run wearing nothing but shorts and boots on the second morning, before the rest of us were up. Do you feel there is nothing you can do about some problem, some loved one you would like to help but can't? Well, take your intention to Chartres! 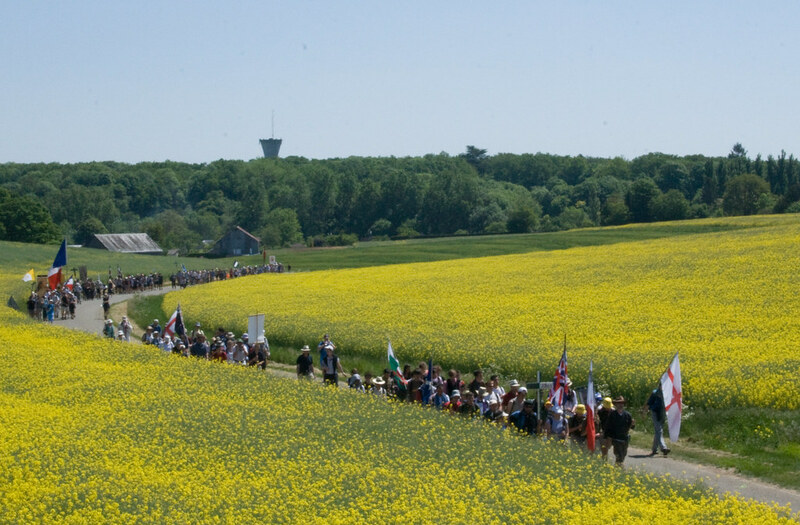 Our organiser Francis Carey said in a speach to the British pilgrims at our dinner after our arrival in Chartres, that when he first experienced it he realised that this was they way Europe would be converted. There is something in this. The witness to the faith, the prayers of the pilgrims, the being prepared to do something extreme, something really gruelling, for the love of God and for the conversion of the world: this is a unique instrument of God for the re-evangelisation of the West. 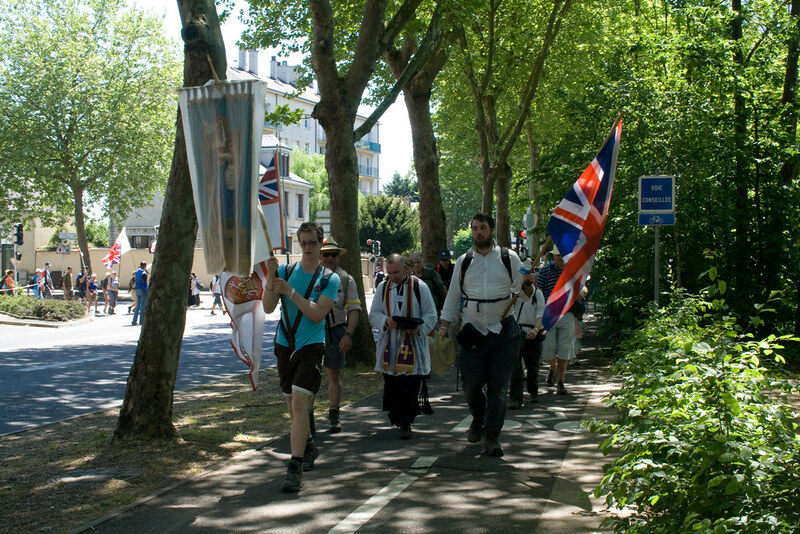 The prices are extraordinarily good value for money and the British pilgrimage is financially supported by the Latin Mass Society, making possible some sponsored places for those who can't afford it. Here is a film with Dr John Rao, the American traditionalist historian, about it, from Gloria TV. For the rest of my photos, see here (slideshow). Good to see Fr. Du Chaxal in the video too! We have reached #Chartres Cathedral!